Born: Feb 16, 1868 in Whitewater, Wisconsin, U.S.
Died: Oct 19, 1952 (at age 84) in Los Angeles, California, U.S.
Edward Sheriff Curtis was born in 1868 to father Johnson Curtis, who had recently returned from fighting in the Civil War which left him psychologically and physically damaged. This made it difficult for the elder Curtis to run his farm and provide for his family. Facing hardships and poverty, the Curtis family moved to Minnesota to find work and a better way of life. When he was 17, Edward Curtis was apprenticed to a photographer in St. Paul, Minnesota, although Curtis already had been studying and practicing photography since he was a boy. He built his own camera after leaving school in the 6th grade. When he was 19, Curtis moved with his family to Seattle, Washington, where he and a partner established a locally successful photography studio. 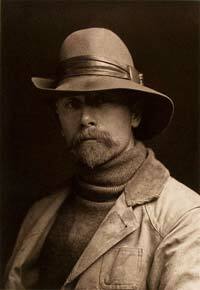 The year 1895 was a turning point in Edward Curtis’ life. That is the year he met Princess Angelina, the daughter of the famous Indian Chief, Seattle. His portrait of Princess Angelina was among a number of studies of Native peoples that were chosen for an exhibition of the National Photographer’s Society. His photo, Homeward, a picture of Native Americans in a large canoe, was awarded the grand prize and a gold medal. This early success launched Curtis on a lifelong career of photographing thousands of Native Americans, from the Pacific Northwest and Alaska to the American Southwest. Curtis was also among the first to use motion pictures to film the traditions, ceremonies, and daily lifestyles of indigenous peoples. A milestone came about in 1906 when Curtis received a $75,000 grant from JP Morgan to produce a 20-volume series that was to encompass at least 1,500 photographs. This was to be more than just books of photographs, however. It was an in-depth, extensive effort involving writers, anthropologists, ethnographers, linguists and a variety of other disciplines. It would become a far-reaching documentation of Native peoples and a 20-year project. Despite the $75,000 in funding, Curtis would receive no salary from the effort, making life difficult for him. Curtis also faced other difficulties, some of which were self-inflicted. He divorced his wife and the mother of his four children, Clara Philips, in 1919. In the divorce settlement, she received his studio and all of its property. He was also required to pay alimony, exacerbating his lifelong problems with money. Over several decades, Edward Curtis produced an enormous volume of work documenting the rapidly vanishing Native cultures of the West. He died at age 84 in 1952, by which time he had long since faded into obscurity despite the achievements of his work. He rarely made significant money from his efforts – part of the reason was that interest in Native American culture was generally lukewarm among the public and even in academic communities. However, when interest in Native cultures re-surged around 1970, the works of Curtis were discovered anew and began to be recognized for their vast importance. The tireless, relentless, and lifelong work of Edward Curtis to document, photograph, and film the lives and culture of Native Americans represents a major contribution to history.